A painting I did twenty years ago of my dad. 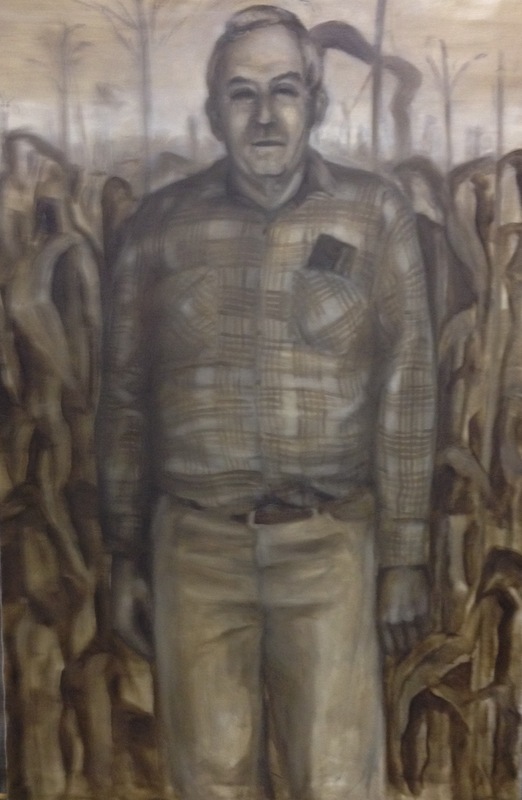 Years ago I started a portrait of my dad (we call him Columbus) emerging from – or returning to – a cornfield. At the time it seemed an odd painting, something more elemental than intellectual. Something I had to paint though I didn’t really know why. I thought I’d left portrait painting far behind. Columbus is from a very small town in Iowa so the necessity of the cornfield made some small sense. He yearned to live in the town of his birth and although life took him other places he maintained a deep heart-root to Monticello. For Columbus, Monticello, Iowa was and always will be home. After laying it out, after applying the under painting, the portrait felt complete – or I felt complete. So, I stopped. I have carried it with me all of these years. 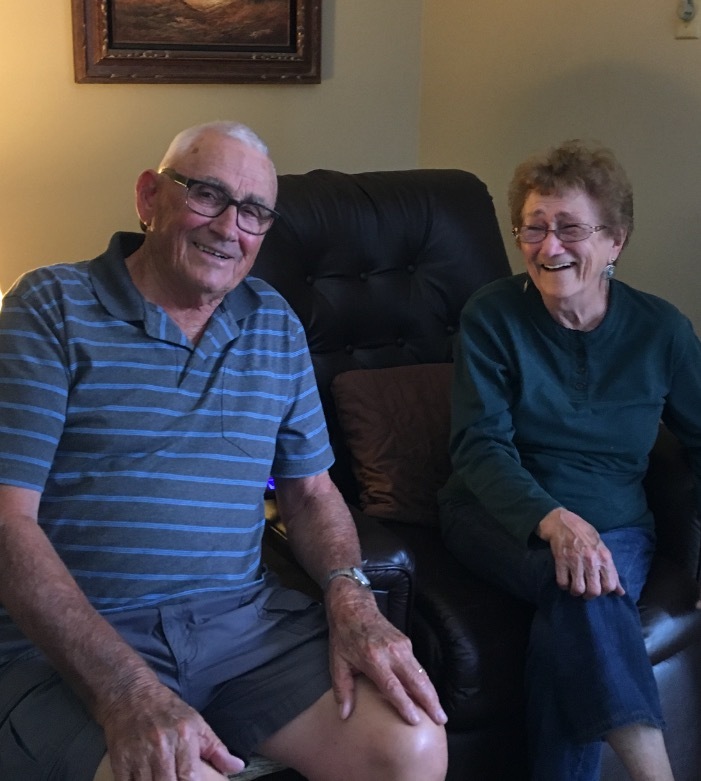 These days, dementia has its slippery tentacles around Columbus. He is a mighty combatant in this tug of war, a war that he cannot win, and feeling his strength waning, his single wish was to one last time visit Monticello. So, this past week, Kerri, my mother, and I – as Kerri likes to say – followed Columbus’ heart around Monticello. His heart took him three places. The first was to the cemetery. It is the place he will finally rest with his brother, parents, grandparents, aunts and uncles and friends. He wanted to wander. 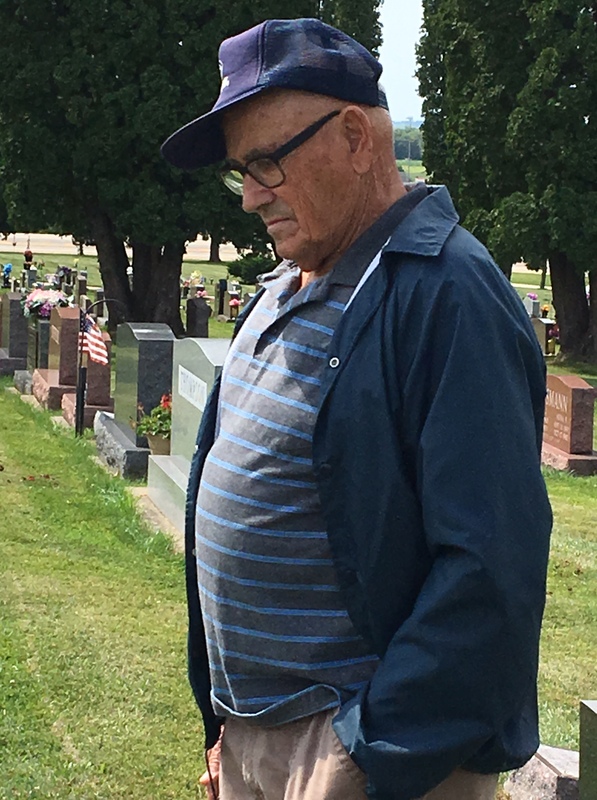 We followed him as he touched stones and told stories – stories he told to us but for himself: a friend who died too young in a car crash, a kind scoutmaster and mentor, an old girlfriend, a high school pal who flew an airplane and their adventures landing in cornfields. We followed, listening, renewed to the deeper truth that the stories we tell of others, the stories of shared time and experiences, both comic and tragic, when combined, scribe the arc of our own lives. Columbus needed to go to the end place to scribe his arc, to touch the depth and arc of his experiences. The second place was the house that his grandpa Charlie built. It was the place of his childhood, the place of his greatest freedom, the place where all his stories begin and, now I know, where they return. This house is the cornfield. It is, for Columbus, the font of family and the source of his ideals. It is the symbol of his pride. 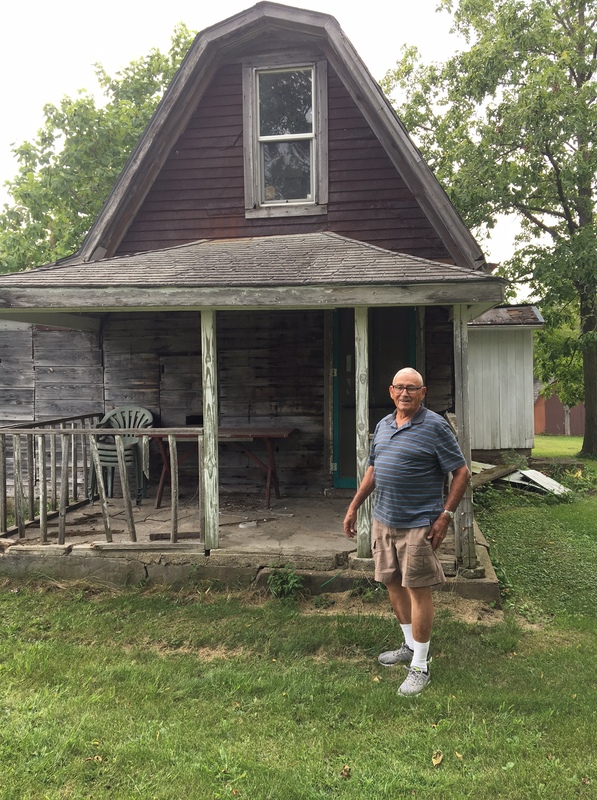 This small house, with no electricity or running water, no indoor plumbing, this house that was pieced together with found material, smacked together with a handsaw and a hammer, an evolution, this house is Columbus’ holy ground. It still stands, just barely. And although now a storage shed for someone, it holds riches beyond words or measure. Columbus needed to stand in the source of his belief. Stories told at the end place. Stories told from the beginning place. Stories told that connect the places. Columbus counts himself a lucky man. He knows with absolute certainty the trinity of places that hold his life/story. 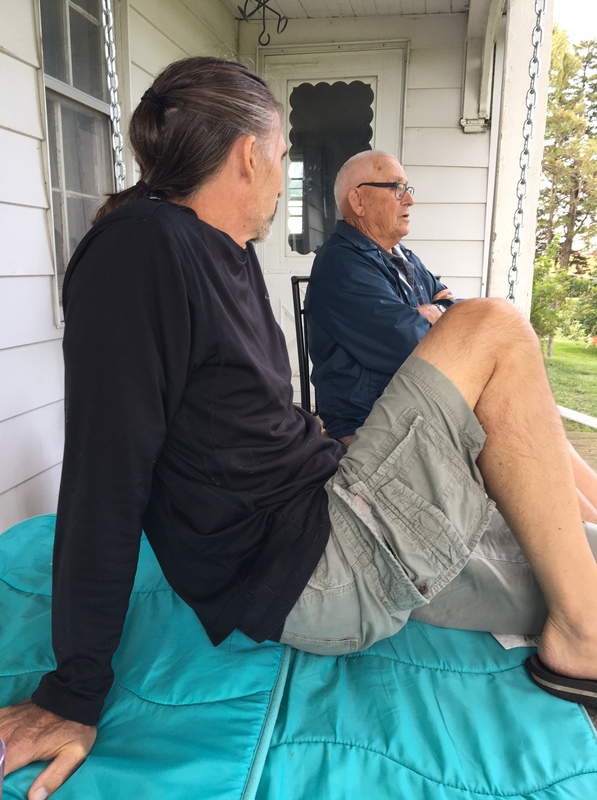 Sitting on the porch he (once again) taught me that stories – lives – are like a river and the flow transcends a single life. He just taught me that the story, a good life, like the painting, is never really complete.